A nice maxim for science fiction, perhaps. But it probably doesn’t sound like productive science. A growing number of high profile scientists and science popularizers have come out in favor of the idea that there may exist a “multiverse” of multiple universes, and that this might explain some of the unusual properties of our universe. If there are multiple universes, each with different physical laws, then we must exist in one of the universes with laws capable of supporting us, no matter how rare or unlikely such a universe is. This sort of argument is called anthropic reasoning. Not to mention continuity reasons. Why is anyone in favor of this idea? It all goes back to the Higgs. In order for the Higgs to have the mass we observe, then, something has to cancel out these large corrections. That cancellation can either be a coincidence, or there can be a reason for it. The trouble is, we’re running out of good reasons. One of the best was supersymmetry, the idea that each particle has a partner with tightly related properties. But if supersymmetry was going to save the day, we probably would have detected some of those partners at the Large Hadron Collider by now. More generally, it can be argued that almost all possible “good reasons” require some new particle to be found at the LHC. If there are no good reasons, then we’re stuck with a coincidence. (This is often referred to as the Naturalness Problem in particle physics.) And it’s this uncomfortable coincidence that has driven prominent physicists to the arms of the multiverse. There’s a substantial backlash, though. 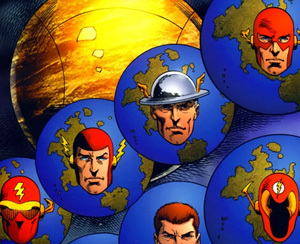 Many people view the multiverse as a cop-out. Some believe it to be even more toxic than that: if there’s a near-infinite number of possible universes then in principle any unusual feature of our universe could be explained by anthropic reasoning, which sounds like it could lead to the end of physics as we know it. You can disdain the multiverse as a cop-out, but, as I’ll argue here, you shouldn’t fear it. Those who think the multiverse will destroy physics are fundamentally misunderstanding the way physics research works. The key thing to keep in mind is that almost nobody out there prefers the multiverse. When a prominent physicist supports the multiverse, that doesn’t mean they’re putting aside productive work on other solutions to the problem. In general, it means they don’t have other solutions to the problem. Supporting the multiverse isn’t going to stop them from having ideas they wouldn’t have had to begin with. And indeed, many of these people are quite supportive of alternatives to the multiverse. I’ve seen Nima Arkani-Hamed talk about the multiverse, and he generally lists a number of other approaches (some quite esoteric!) that he has worked (and failed to make progress) on, and encourages the audience to look into them. Physics isn’t a zero-sum game, nor is it ruled by a few prominent people. If a young person has a good idea about how to explain something without the multiverse, they’re going to have all the support and recognition that such an idea deserves. What the multiverse adds is another track, another potentially worthwhile line of research. Surprising as it may seem, the multiverse doesn’t automatically answer every question. It might not even answer the question of the mass of the Higgs! All that the existence of a multiverse tells us is that we should exist somewhere where intelligent life could exist…but if intelligent life is more likely to exist in a universe very different from ours, then we’re back to square one. There’s a lot of research involved in figuring out just what the multiverse implies, research by people who wouldn’t have been working on this sort of problem if the idea of the multiverse hadn’t been proposed. That’s the key take-away message here. The multiverse may be wrong, but just considering it isn’t going to destroy physics. Rather, it’s opened up new avenues of research, widening the community of those trying to solve the Naturalness Problem. It may well be a cop-out for individuals, but science as a whole doesn’t have cop-outs: there’s always room for someone with a good idea to sweep away the cobwebs and move things forward. This entry was posted in Astrophysics/Cosmology and tagged cosmic inflation, cosmology, DoingScience, Higgs, philosophy of science, PublicPerception on October 3, 2014 by 4gravitonsandagradstudent. I don’t hate it (let alone fear it), but I don’t much like it, either. It seems to violate Occam’s razor, although I realize that’s not a principle, just a heuristic. The thing I’ve never read a decent explanation of is where all the energy comes from. I read Lawrence Krauss’ book, A Universe from Nothing, three times, and despite his attempt to address that very question, I remain puzzled and unsatisfied. The first part of that book is solid and detailed in laying out the physics basics, but once he gets into his primary thesis, it seems to get vague and very hand-wavy to me. If dark energy is a force that drives expansion, and if expansion itself creates “negative energy” that balances out the energy, that seems somehow circular reasoning. It’s really hard to believe all this physical universe (let alone the dark matter and energy) is just a book-balancing trick. First, I should point out that the issue you’re having is with inflation, not with the multiverse. Inflation might not lead to a multiverse, and there are versions of the multiverse that don’t rely on inflation. Second, there’s a tricky element here that most people don’t know about. It’s common to think of energy conservation as an absolute rule, but it’s actually a consequence of time-invariance. Because the laws of physics don’t change over time, energy is conserved…but create a situation where the laws do change over time (say because the universe is expanding) and energy conservation doesn’t hold anymore. Now you might say that we’re just ignoring the energy of the expanding universe itself, but the trouble is it’s really hard to define that kind of thing in a consistent way. Energy depends on the reference frame, the perspective from which you’re looking at something. If you’re next to the train tracks a train appears to have a lot of energy, but if you’re on the train it seems like it’s standing still. The same sort of thing applies when space expands or contracts. This means if you want to measure the energy that comes from the expanding universe, you have to take into account the fact that the expanding universe changes how you measure the energy…things get quite messy very fast. All I’m trying to say here is that this is one place where intuitions don’t work very well. The math says inflation works, and trying to understand it from the point of view of energy conservation probably won’t help very much. Lee Smolin’s idea of evolving universes, which converge on a universe friendly to black holes, must occur in some meta-universe with meta-physics to support such an evolution. There always seems to be something circular in the reasoning. Actually, the idea that the big bang created the physical laws of this universe is itself not something physicists are certain of! There are lots of different pre-big bang scenarios, and only some of them work the way you’re thinking of. More generally, the big bang didn’t create all the physical laws of this universe. If physical laws were set by the big bang, they would have been things like which particles exist and what masses they have. The big bang would have been such high energy that things like that wouldn’t be relevant. More basic laws, like relativity, aren’t created by the big bang and wouldn’t vary from universe to universe. The evolving universe idea is one that definitely requires some sort of multiverse/meta-verse, yes. I don’t know which one Smolin favors (in fact, I hadn’t remembered he was behind that particular idea), but essentially in those setups a big enough universe can “birth” a new universe via a black hole, so you get a series of universes that end up dominated by those more friendly to black holes. Yeah, Lisa Randall talks about some of the pre-BB scenarios in Warped Passages, and I know that some multiverse scenarios involve new bubbles of inflation in existing universes. I just wish I live long enough that someone finds something really new in physics! Turtles is an option, though as you mention it’s not a very satisfying one. I’m still holding out hope that the basic rules of our universe are mathematically fixed in some way, so that our universe is the only way things could have turned out.